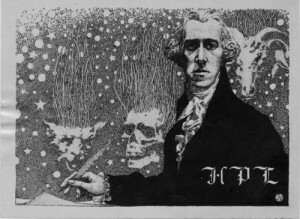 Brown University Library Celebrates Lovecraft with an Exhibit and New Research Fellowship! PROVIDENCE, R.I. [Brown University] —Brown University Library, home to the largest collection of H. P. Lovecraft materials in the world, is pleased to co-sponsor a two-part exhibit this summer in partnership with the Providence Athenaeum, and to announce a new annual fellowship for research relating to H. P. Lovecraft, his associates, and literary heirs. “The Shadow Over College Street: H. P. Lovecraft in Providence,” will be on exhibit August 19 through September 22 in the Philbrick Rare Book Room of the Providence Athenaeum, and a smaller satellite exhibit will be on view in the lobby of the John D. Rockeller, Jr. Library from August 19 through October 24. Mounted in conjunction with NecronomiCon Providence, this collaborative exhibition explores Lovecraft’s youth in Providence and the city’s role in shaping his career as a master craftsman of “weird fiction.” Both parts of the exhibit feature materials from the John Hay Library. And, starting in summer 2015, the S. T. Joshi Endowed Research Fellowship will provide a stipend of $2,500 for six weeks of scholarly work with the world renowned resources on Lovecraft at the Hay. The S. T. Joshi Endowed Research Fellowship is sponsored by The Aeroflex Foundation and Hippocampus Press, and is named for S. T. Joshi, Brown alumnus (’80, MA ’82) and prominent Lovecraft scholar. More information regarding application procedures will be announced in Fall 2014.